Robert M. Royalty, Jr. 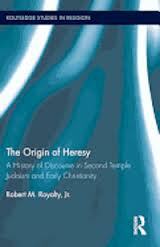 The Origin of Heresy: A History of Discourse in Second Temple Judaism and Early Christianity. New York: Routledge, 2013. It has recently come out in paperback which means it is more affordable for libraries and interested people. Royalty will be part of a panel discussion on his book at SBL in Atlanta in November 2015. The session is sponsored by a program unit called The Extent of Theological Diversity in Earliest Christianity. I’ll give a more thorough review later, but let me for now just lay out the thesis. Royalty, along with other scholars and historians of the period, is committed to helping modern folk hear the suppressed voices of some of these other Christian groups. But the “orthodox” (or right thinking) Christians were not the only ones dealing in this type of rhetoric. Groups that later came to be identified as heretics–by the orthodox–were themselves adept at mocking their opponents and criticizing their teachings. The rhetoric of difference and disagreement had deep roots throughout the Mediterranean world in the first few centuries of the common era. If you’re interested in Christian origins, this is a book you need to read. If you are in Atlanta for SBL in the November 2015, stop by our program and get a taste of what Royalty is up to. By David B. Capes in Uncategorized on July 20, 2015 .